Chia is everywhere. It’s touted to be a ‘superfood’ but what it really is, is a super easy low carb chia breakfast – 4 ways. It is the richest source of plant omega 3, complete source of protein, fibre, antioxidants, and nutrients such as calcium, potassium and iron. Chia apparently gave the Aztecs strength, endurance and health. What I love about Chia seeds is their neutral flavour and their ability to absorb water, setting to a gel consistency. This means you can make grain free, wheat free and gluten free dishes pretty easily without adding flour to thicken them. Porridge, puddings, and especially low carb chia breakfasts. You can even use the Berry Coconut Chia Breakfast as a sugar free jam! Or use as a tasty topping to paleo pancakes. Children love chia breakfasts as they have the texture of a pudding. Who doesn’t want chocolate for breakfast? Add chia seeds to your choice of liquid, such as coconut cream, coconut milk, milk, nut milk, water then add your own variety of flavourings, fruits and spices. Add some berries to make it even healthier and packed with nutrients and antioxidants. Low carb chia breakfasts will keep your children fuller for longer and help them concentrate with all those Omega 3’s. As a rule, I generally use the ratio of Chia seeds to liquid 1:9 which equates to roughly 2 cups (or about 450ml) liquid to 1/4 cup (30g) chia seeds. You can go as high as 1:6 if you really want the chia seeds to set pretty firmly, such as a ‘jam’. The ability of the chia seeds to gel firmly, also depends on the liquid you use. If coconut cream is used, this sets firm in the fridge anyway, so expect a more solid low carb chia breakfast than liquid. 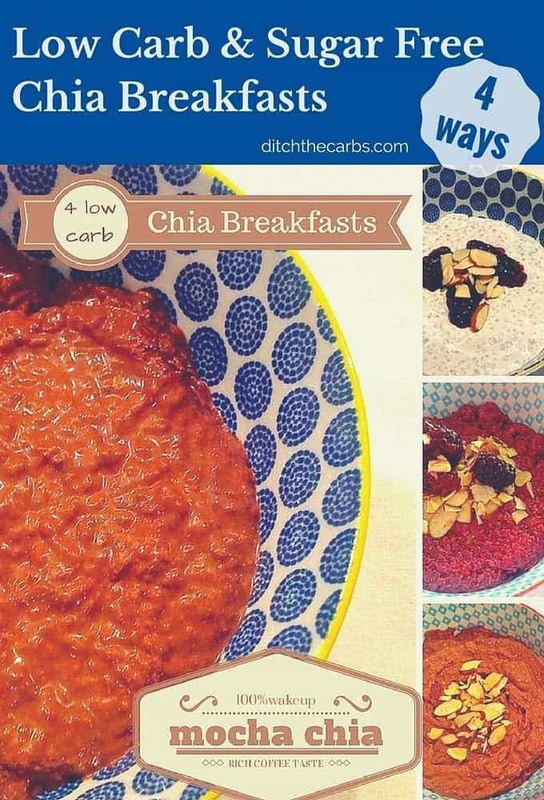 To make the low carb chia breakfasts, just throw everything together in a bowl the night before to allow the Chia seeds to swell and absorb the flavours. By morning, your breakfast is ready. Easy as. Top tip!!! To be uber trendy, pack them in a Mason Jar and tote them to work on the ferry or train. 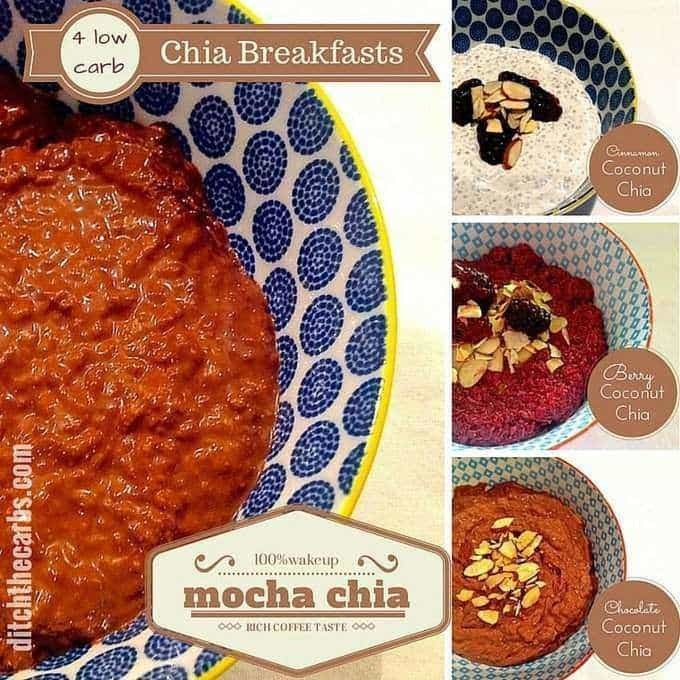 Low carb chia breakfast - 4 easy will be sure to please everyone. This protein in the chia and the healthy fats in the coconut cream will keep you full until lunch time. Put all the ingredients in a bowl. Mix and refrigerate overnight. Break up the berrys with a fork, then mix all the ingredients together until nice and pink. Update :: This competition is now closed. Healtheries have kindly donated 5 amazing prize packs for me to giveaway to Ditch The Carbs readers. Chia seeds can be used in baking, salads, soups or added to smoothies. 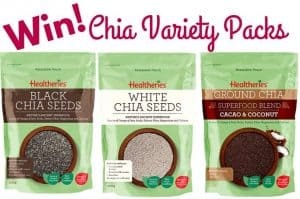 To enter, simply leave a comment below using the Rafflecopter entry box, telling me how you would use chia seeds. Terms and conditions :: Prize packs are available to New Zealand residents only. Entires are open from Thursday 24th September 2015 – Monday 28th September 2015. Each prize pack consists of the products below which will be sent to the winners directly from Healtheries. I will only disclose the 5 winning emails to Healtheries once the draw is completed. This giveaway is in no way sponsored, endorsed, administered by or associated with Facebook. Hi, After you leave it refridgerate overnight, can you heat it up? Yes, although when you heat coconut cream the resulting chia mixture may be not as thick. Coconut cream thickens when it is cool as the coconut oil solidifies. does not compute. I understand you must refrigterate chia overnight, but to say total time is 5 minutes is quite a stretch. Just had the chocolate coconut pudding for breakfast for the first time. Loved it! I’m not keen on coconut but I couldn’t really taste it. I used a whole tin of coconut milk and didn’t add any water because the liquid was sufficient. The only thing I would do differently is bring it out of the fridge and let it stand for a few minutes before eating, it was a little bit cold for my teeth! I’ll certainly make it again. Gives “Angel Delight” a run for it’s money! Are the macros correct? When I calculate the Mocha Chia Breakfast it comes up as 5.5g Net Carbs using the same brands as you used. can u put recpies in imperial as well as metric? how about the calories, can u plz mention how many cal in each ? i am following the keto diet and it will be very helpful. Looking at your pictures of chia breakfasts I have to ask – where is this reddish color coming from? That will be the berry coconut chia. the recipe calls for 50g / 1/2 cup berries. Wow! Amazing!! I have had the Chocolate Coconut Chia for the last two mornings and so full and such great feeling! I was a little sceptical as I’m not a massive coconut lover, but this has amazing flavour and feels like I’m being naughty having this for breakfast! I might make it for a pudding too! It has incredible flavour and I’m actually finding time to eat it (with four kids 6 and under….I quite often forget to have breakfast!) Looking forward to being a healthier mummy! Not knowing the ratio of your chia:flax blend, I can’t really say how thick they would turn out. But I am sure you could experiment and possibly add an extra tablespoon or two to ensure they thicken and set beautifully. Just made the mocha-I don’t even know why I have tahini in the cupboard but anyway it’s all in the fridge looking forward to eating it tomorrow when I get hungry..
Hi can I use Greek yoghurt instead of coconut cream in these recipes? Sure, just check the carb content. Brands vary so much. I am in love with the chocolate coconut chia breakfast!! I have made the berry and mocha a few times and really like those but the chocolate version is now my go to breakfast and dessert. For me, it is better than any mousse recipe. Thank you,Thank you!! I wish I hadn’t taken so long to try it. Sooo good. Tried the Chocolate Coconut Chia breakfast with my kids. We don’t buy cereal breakfasts,so they’ve never had Coco Pops before and gave up asking for them .Simply got tired of being told no so they we’re genuinely excited at the prospect.So I thought the latent desire for Coco Pops might be enough to win them over to try something different. However.the barriers came up because the Chia simply didn’t resemble the look of the Coco Pops cereal even though the taste was there.It was evident that my strategy had some holes in it . They were quick to resist on the look alone and of course once the older resisted the younger one picked up on it. My eldest bailed after a few spoonfuls and was delighted that the school bus was there to rescue him. I managed to spoon feed it into my youngest even though there was some resistance she collaborated in the end but it was a forced march to be honest. I had it myself and couldn’t believe how filling it is ….it’s genuinely a real surprise I must say! The texture was a challenge for the kids to take on given the leap too large from the baked beans on wholegrain spelt toast that they’re used to.I imagine the disapointment of the Coco Pops imposter didn’t help either so I may have been over ambitious and could’ve used a more incremental approach. They quickly detect the Chia kernels and make a point of rooting them out with their fingers to show you :-). I love this story, thanks Don. And as for trying to fool them into thinking chia is cocoa pops, hilarious. OMG! Cinnamon Coconut with ground almonds was so delicious. I put a little lime juice and zest and a few blueberries. My son and I loved it. Can’t decide if its breakfast or dessert. Thanks Libby. Yes you do taste the coconut cream. Why not look at my breakfast recipe finder. They are all set out my photos so you can choose something she will enjoy. There are plenty of options in there. Loved the Berry chia! Made the Mocha chia last night and I have a layer of liquid on top. I didn’t let the coffee get cold before I added it. Maybe that is the problem? OMGosh! Tried this this morning warmed up – so GOOD! My question though is about the coconut cream. The first recipe calls for 2/3 c., the others all 1 1/3 c. That’s a pretty hefty calorie difference according to MFP.. Does the 2/3 c. coffee make that much of a difference? If I used less coconut cream can I sub in something else? and, yes, as an incredibly metabolically damaged, insulin resistant T2 diabetic, I still have to be conscious of calories, not just carb & protein. There is a certain ratio of liquid to chop seeds you need to use, so it’s up to you which liquids you use and how much coconut cream if you wanted to cut back on that. I just made the cinnamon one, I only used 2T of almond flour because it seemed strange to eat uncooked flour lol. Anyway what are the calories on each of the pudding? You have carbs, fats, protein, but no calories. I have never tried chia seeds before. I look forward to trying dishes with them. Never used them before, I think I’d try out your recipes above or put them into my home baking somehow. I put them in my smoothie every Am. I’d like to try and branch out though and see how they are in other ways. I make Chia Seed puddings with coconut milk and fruit for breakfast. Delicious! Chia seeds are great if used before they’ve completely swelled, the’ll continue to swell in your stomach, making you fuller longer! I like to sprinkle a few on chocolate fudge with some cocoa nibs to give some crunch and additional fiber! I use chia seeds in my smoothies and breakfast puddings 🙂 am going to try them in a soup like suggested above! I am going to make a breakfast recipe using chocolate protein powder, strawberries and chia! What is the calorie count on each serving please? Absolutely! Make them the night before then just warm through using the microwave or on the stove top. Is there a sugar-free vanilla paste available? alternatively I found a recipe to make your own – with vodka!!! I got a bit obsessed making these as puddings. Today I forgot to soak any chia so gave flax a try. 1/4 cup flax, 1.5cup milk, 25g whey protein, 1tbsp coca powder, 1tbsp peanut butter + stevia to taste. Heated it in the pan and it ‘glopped’ together really quick. A delicious hot chocolate pudding that could be a breakfast. Yum! Take a look at my food label page where you can see the coconut cream I use. it is generally 2-4% carbs and 20-25% fat. It can come in a tin or a litre box. If you can’t buy it, use coconut milk and add some creamed coconut. It may take some experimenting until you get it right. I am wondering if I can make these even more in advance and freeze them? Probably not. I don’t think they would defrost very well and may separate once thawed. Hi, is the nutritional information for both serves or just one? Have just put mine in the fridge ready for brekky in the morning. Looking forward to it! My husband is hooked! He’s been eating these “puddings” for dessert every day for the past week! Thanks so much! I made the chocolate chia and wasn’t crazy about it by itself. I added it to yogurt with a few nuts, though, and it was delicious! I’ll have to try the other flavors! That is 100ml or 300 ml stands for millilitres. 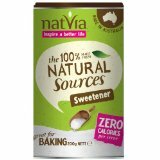 Hi – just want to check on the amount of Stevia in the Mocha chia – 2TBS seems a lot for stevia glycerite (I normally only use something like 1/4 teaspoon in a recipe), would I really need to use that much? Thank you for your lovely inspiring recipes ! Hi Annie, I’m glad your daughter liked it. The coconut cream I use comes in 400g tins or 1 litre packs. There is such a variation on brands. To give you an idea of mine, it is 25% fat and 1.5% carbs. Hope that helps. Libby. (P.S. My favourite chia breakfast is the berry one). My daughter is mad about Chia ( 21 year old student) so keep the recipes coming. We bought a book yesterday on the strength of a recipe for -Chia mango and Macadamia Trifle (cut the carbs by Tori Haschka ) I feel the mango and lychees would be too much for me trying to lose weight but something for the future ! Will try the berry one ! I only discovered chia seeds this weekend and am in LOVE! Your coconut recipe is amazing; made it yesterday & my husband and I finished it off! So delicious! I’ve just made another batch today! Thank you! Excellent to hear. I’m going to start using them in baking too, so watch out! It sounds like they absorb a lot of liquid, is it best to allow them to absorb all moisture they require before eating them? Hi Jenni. I let them totally absorb the liquid as I like to prepare the Chia for breakfast the next day, others add them straight into a blender to make smoothies. If you don’t let them absorb liquid first, you have to ensure you drink plenty of fluids otherwise they will absorb water from your stomach and possibly lead to stomach cramps. I am in South Africa. Where can I get Chia? I’m not sure, I can ask on Ditch The Carbs Facebook page if you like. Libby. In SA you can also get Subja or Tukmuria (cousin to chia) in any indian spice shop. It tastes exactly the same and benefits are just as good. Is is also very cheap. Chia is also availavle at any Dischem pharmacy. Hi Libby, you finally convinced me to go and try out Chia Seeds. I’ve asked my wife to drop into a health food store to purchase for me. (She’s nearer to shops than where I work) I normally have flaxseed in my morning porridge, but its time to try out this “superfood”. Thanks for all the great recipes and posts you continue to write! Yay Neil. Let me know how you get on. My next trial will be having it hot, like porridge (but without those insulin driving oats). And thanks again for the great feedback. It’s always a boost. Libby.